enable teachers and other children's workforce professionals to celebrate what makes us 'all different, all equal' and celebrate difference and equality. Encouraging them to take individual and collective action to prevent bullying, creating safe environments where children can be themselves. We are excited to be holding a competition this year for Leicestershire Schools. We would like young people to design a poster to advertise Leicestershire's Anti-Bullying Team website and Twitter account. The winning poster (or elements from a number of winning entries) will be used as promotional material at events to help spread the Beyond Bullying word! 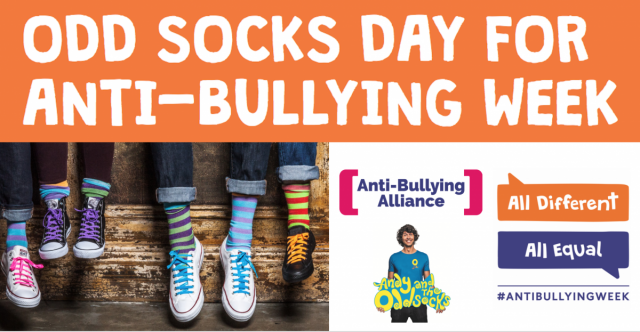 The Anti-Bullying Alliance also has ideas and resources on their website, including information about 'Odd Socks Day' on 13th November. Why not join in and encourage your children and staff to wear odd socks for the day and raise money for a good cause! Stonewall has also developed resources for schools based around this year's theme. For primary schools, they have developed a lesson plan based on the book 'Are you a boy or are you a girl? By Sarah Savage and Fox Fisher. For secondary schools they have created an assembly which schools can use as is or adapt.